family together in an intimate fun way for a day of bonding and relaxing. Spa & Wedding parties are for guest of (5) or more. Our Express Service is a shortened service version of the traditional nail/pedi service featured on this website. You still receive the same quality service, but for larger groups with limited time, this option works best. Choose up to (2) Services for the Hourly rate. Choose from: Express Facials, Express Mani, Express Pedi, Brow&Lashes, Makeup Application or Massage Therapy. **Shellac Polish is a $10.00 upgrade** Additional add-on services over the allotted (2) will incur the hourly rate. 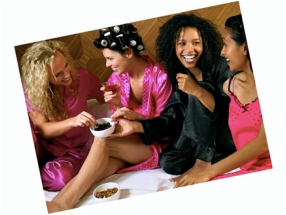 **Groups with 5-10 people will have (1-2) Nail Techs & (1-2) Pedicurist available to staff your event or party** There will be an additional $55.00 per hour for each additional service provider needed to staff group parties and events for 11 or more guest being serviced in the group party. Please consider the time needed for each service when utilizing the hourly rate. Refer to the above listed service for the approximate time needed for each service. This will allow for you to determine how many services can efficiently be done in an hour. 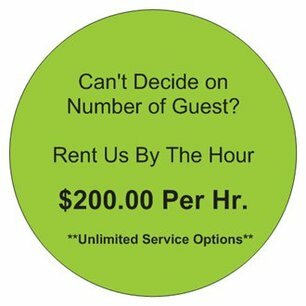 We will try to accommodate as many services within the hour in a "reasonable" manner, but if the time goes beyond the hour we will charge for the following hour or the services will be billed per person. *All initial deposits are taken via PayPal or Square. Any remaining balances after the deposit has been made will be collected on the date of service. *Advance Appointments are required for Group Bookings. Group appointments that reserve "short-notice" appointments for the same day will be required to pay for services in full. A partial payment will not be accepted. *Deposit will be collected upon final count for number of guest and payment will be invoiced via Paypal or Square and is due 14 days prior to event date. *Party dates arranged for same day service; deposits are required 5-6 hours before the start of the designated party time or the party will be subject to cancellation. Please note same day party reservations will only be accommodated if there are service providers available for same day service. *Deposits are non-refundable if client cancels group party. Deposits are used to secure the time of our service providers. *If inclement weather arises that is deemed unsafe for travel, the event will be cancelled and deposit refunded in full. *A $1.00 per mile (round-trip) travel fee will be incurred for all confirmed parties outside of the local: Raleigh, Garner, Cary and WakeForest areas.